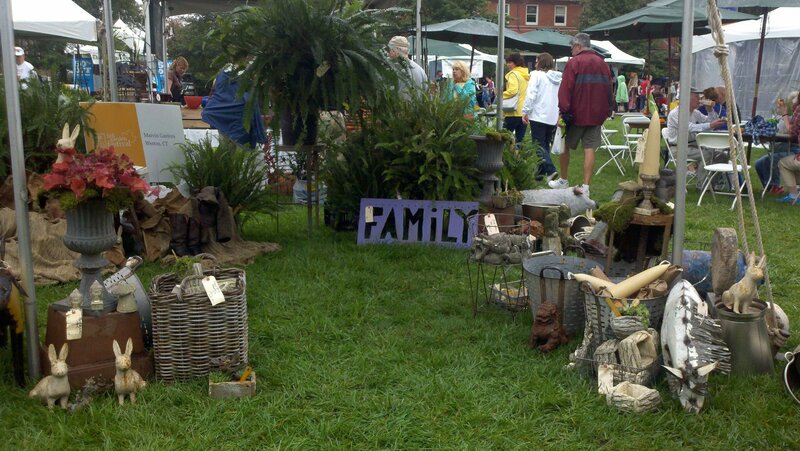 Philly Horticultural Society’s Fall Garden Festival a Huge Success! Despite the nagging rain’s attempt to pour down throughout the day, the Philadelphia Horticultural Society’s Fall Garden Festival this past Saturday managed to stay relatively dry and was a huge success! Marvin Gardens had a grand time and was happy to see such great attendance from such enthusiastic folks at the Philadelphia Navy Yard! Thanks again to PHS! You just continue to do a great job creating fabulous events, year after year! To learn more about becoming a member of the Pennsylvania Horticultural Society, please click here. If you would like to volunteer at the Festival, click here to learn more. There is no need to pack up and store your outdoor furniture all winter long, many pieces, like this beautiful garden seat and be moved inside to add a pop of color and warmth to your sitting room. The garden seat can be used as an extra seat or table when you have guests. If you do move your outdoor furniture indoors, be mindful of the space. Think about where people site to converse and leave room to walk, don’t make your sitting room an obstacle course. What do you think about bringing your outdoor furniture in for the winter? As we mentioned last month, Marvin Gardens’ philosophy is simple and is one that aims to break the traditional mold when it comes to sophisticated garden design. That’s why every single item we obtain has a unique history that comes along with it and can be used in a number of creative ways. Take this particular item from our most recent collection. The vintage cast iron fountain can be used as a garden accent among a variety of other softer items but is still bold enough to stand alone as a centerpiece! Here are some more versatile items we just received. If you’re in the New England area and are in search for some innovative garden pieces to accent your landscape, visit our Facebook page or contact us directly for more information on our entire collection! Here at Marvin Gardens, our philosophy is simple. We believe in using the process of creation and mind-shifting to add genuine value to one’s garden, home and life. By creating new designs, resurrecting new life out of old, breaking the patterns of trendsetters, being a style maker, breaking out of old patterns of thought in all other aspects of life helps to emphasize one’s own uniqueness and individuality. Marvin Gardens is proud to provide the consumer with innovative ideas and eclectic home and garden elements to enhance this philosophy. Take a look at a few items from our latest collection that break the mold and have a new breath of life in them. Contact Marvin Gardens today to learn more about these gorgeous items!